When it comes to a first attempt at something, most games play the safe card and try to provide the most serviceable, coherent experience possible, letting future sequels -- if successful -- take care of necessary refinement and new additions. These games nail the core experience but do so without the bells and whistles, all in an attempt to prove that they can achieve what was intended. Race Pro, way back at the beginning of 2009, is a great example of this: its driving model is almost on par with the likes of Forza and Gran Turismo; its car selection and track variety decent enough to be enjoyable but nothing spectacular; and its impact on the market subtle but significant. 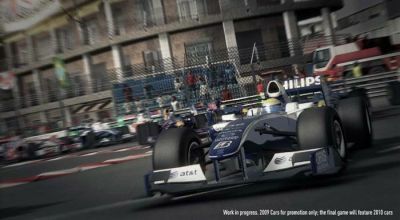 F1 2010, the newly released game based on the current Formula 1 season, is a game that should do as described above: it should be a decent enough first attempt that isn’t amazing, but is alluring for those interested in the sport, its spectacle or just racing games in general. Instead, F1 2010 is quite possibly one of the best racing games I have played in a long time, and this is after just a few hours with it. Before I get into why it is so amazing, let me quickly explain its status within the market. F1 2010 is not the most beautiful racing game around but its visuals are solid. The expected mundane appearance of most tracks (as in real life) means that for the most part, everything looks decent but the reality is, when you’re playing the game proper it is something you are not going to notice. Anything that may stand out visually -- birds flying above you, a nearby lake, etc. -- is largely ignored as you hurtle on by and focus on what you need to be doing. Character models -- what few there are -- are average at best and animation is adequate but inconsistent. Aurally, the soundtrack is minimal (though the inclusion of Pendulum is welcome) and the voice acting is moderate. That’s a good thing though given that the engine note of a Formula 1 car is a better tune to be listening to anyway, and it’s here that the game does a pretty remarkable job. Everything from the different rev ranges an F1 car can hit to the sounds of the other cars as they race at different points of a track, drive down the pit lane or change gears too late and over rev the car, is featured in the game, the sound playing an integral part in forming the experience. Lastly, the physics engine is astonishing for a first attempt, but perhaps not as nuanced as something like Forza. It doesn’t have to be, though. Why? Because driving a Formula 1 vehicle is unique and certainly isn’t like driving anything found in that game, or its closest rivals. The best thing I have enjoyed about the game so far is how nicely Codemasters have nailed everything that I have heard, everything I knew from watching the sport for years, with their physics engine. Things like how an F1 car becomes easier to turn, easier to steer, the faster it is going; or how late you can brake into a corner, still hit the apex and accelerate out of it early, all in a matter of seconds and yet still smoothly and efficiently. Gas up the car too early out of a corner and you’ll spin out; accelerate too slowly and you don’t get to take full advantage of the car’s power, force and speed. Enter a corner casually and you take it slowly -- despite being cautious -- because the tires aren’t running at their maximum grip levels; enter it too fast and you’ll meet the grass, the gravel or worse, the barrier, hampering your progress if not halting it completely. Racing in this game and indeed, the sport in general, is a different beast to most other forms of racing or racing games and it shows. Your approach needs to be different, your mind needs to consider completely different things than you may expect, and your consistency? That needs to be earned, not delivered, through practice, understanding and confidence. More amazing, potentially, is how faithful the game’s atmosphere is. The first time I drove out of my pit garage I had a giant grin on my face. Not because I was playing an F1 game, not because I was driving on a track I hadn’t done so before, and not because this was a new game -- I had a smile because instantly, at that very moment, I felt like I was in Formula 1 and that’s the kind of thing that can’t be replicated easily. The tracks looked like they do on TV, with the width, barrier placement and general aesthetic of the locations (I’ve tried so far, at least) seeming like an exact replica; the sound of my car bouncing off the walls as I sped past was exactly as I imagined it would sound were I in the cockpit in real life; and as explained above the feel was unbelievable. Throw in the 23 other vehicles and I was -- as a Motorsport fanatic in real life -- in heaven. The AI seems to be quite good (this is on the hardest difficulty setting) and their approach to the various sessions seems to mimic those seen in real life, exactly as it should be. In Practice they take short stints, exiting the pits for a couple laps before returning, running at a reasonably fast pace but nowhere near maximum and backing off or moving to the side if you are near. In Qualifying they go for the three lap stint I’ve explained before, using the first lap to get warmed up and prepared to set a flying lap, the second to achieve their lap time and the third to either calm down again to return to the pits, or have another attempt at a time. And in races, they duck and weave as they try to get past, slipstream behind you to gain a slight speed advantage and take risky dives down the inside. They also make mistakes such as dipping a wheel in the grass or going too wide around a corner, meaning that they are competitive but not unbeatable. When you consider that this all occurs with a great sense of speed that is really intense and requires a lot of concentration (more on this soon), you have a game that can really take you for a ride, should you let it, and the end result can leave you exhausted. But you know what? It’s all worth it, because if you put the effort in you will be rewarded with a game that doesn’t just simulate Formula 1 superbly, it gives you a racing experience that is arguably unmatched. High praises to be sure but entirely justified. Codemasters haven’t just brought us an F1 game; they’ve delivered the F1 experience. There can be no better use of a licence than that. Hey Steven! great piece on the game! You must really love this game, giving it such high credits! However there are some things that I think are making this game into a "not quite perfect" formula 1 racing game. Let me first of all say that i really like the handling of these cars. When racing online (im not sure if you already have, if you haven't, shame on you ;-) )you really notice the difference between the cars. This is also a bad thing though. with online racing (ranked), your car is assigned to you, randomly, wich is not really fair as you can imagine. Also, there is no leaderboard, at all! All they track is your current level, that's it! To go back to singleplayer, i am missing something in it. The graphics are not bad, but they are not great either. I am also missing the atmosphere. The pit boxes are closed completely, the pit walls are empty, there are no marshalls to the side of the track. All these little things make the game less alive, less vibrant. At times even a little dead. If it wasn't for the focus needed to actually keep the car on the road, it would be something to get irritated about. Just little things here and there that seem so easy to solve, but for some reason, they haven't, why i don't know. They did copy Forza 3's rewind function, but they didnt copy the ability to save your replay, or have a decent leaderboard. Maybe after all the waiting and watching the teasers i got my hopes up too high, i don't know. Don't you think they could have done better?